For years Tackle Industries has been known to make some of the highest quality and affordable lures on the market for freshwater and saltwater fishing. Finally, a fishing rod has been added for today's fisherman that matches our high quality and affordable prices. Throwing large muskie lures requires a top quality musky rod with a lot of backbone for both the cast and the hookset. To meet the daunting task of tackling monster trophy musky and Northern pike, Tackle Industries has introduced a series of muskie rods to handle all of your needs. Tackle Industries rods are not only for trophy musky and pike fishing but can also be used for some of the toughest saltwater and freshwater game fish around. 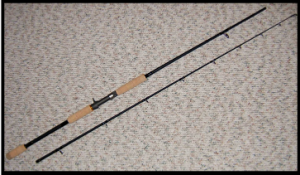 For the ultimate storage Tackle Industries has designed an all new 2-piece 9' rod that breaks down to 2-4.5' long pieces. Great for fly-ins and short rod lockers in your boat.